Last week I posted about Ottawa's School Bus Safety Awareness Day. To briefly summarize it's a day where the Ottawa School Boards have opted to have McDonald's foot the bill for a drop-in program where 4 years olds can learn how to get on and off a yellow school bus. In return, McDonald's is given free rein to give trusting preschoolers junk food, coupons for ice cream and McDonald's colouring books and place mats. 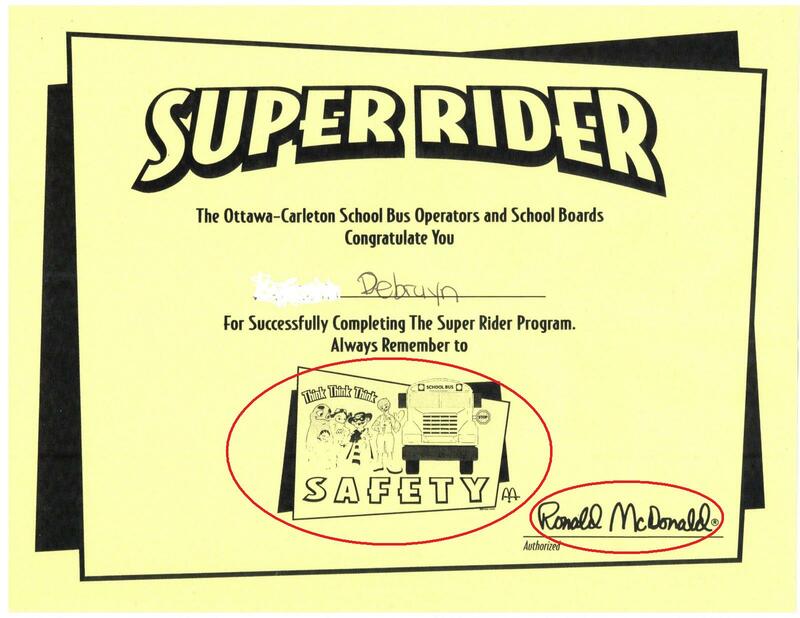 In other words, in the name of school bus safety, the Ottawa School Board has invited McDonald's to put your 4 year old children in their advertising gun sights. A few days after my post went live I received a concerned phone call from the school board. The gentleman who phoned me was quite upset with my characterization of School Bus Safety Awareness Day. He wanted to inform me that it began 18 years ago following 3 school bus related deaths and that it was an invaluable resource for parents and their children. Before I get into the invaluable resource stuff, let's talk about the school bus deaths. Were kids unschooled in school bus safety responsible for them? To figure that out, I decided to look them up. I searched Google's newspaper archive for Ottawa school bus deaths for the years 1980-1992, and indeed, I found 3. The first was a 17 year old girl who was thrown from the backseat of the bus when it hit a speed bump while traveling 50km/hr. The driver of that bus was charged with dangerous driving, careless driving and failing to report an accident. The second was an Aylmer boy who dropped a bunch of hockey cards in front of the school bus and when he bent over to pick them up, the driver ran him over. The third occurred when two school buses had a head on collision and a boy was killed. So based on those deaths I'd say if anyone needs School Bus Safety Awareness day it'd be school bus drivers though even there I'd argue that 3 deaths in 30 years of school bus driving sounds pretty good considering the number of kids, buses, kilometres involved and frequency of just general accidents. Now back to School Bus Safety Awareness day being an invaluable resource. That confused me some, as personally I find the whole notion of there being a need for a special School Bus Safety Awareness Day to border on the ridiculous. Parents already teach their children to look both ways before they cross the road, how much more difficult would it be for them to also teach their children not to push other kids in line, to take their seats on the bus, not to leave their bags in the aisle, and not to pester their drivers? Think I'm exaggerating and that the school board gentleman's right, that there's really complicated stuff that gets taught to the kids? Stuff that's so important that the Ottawa School Board's got no choice but to invite McDonald's to market to your 4 year olds to pay the bills for this program? Well then why don't you have a peek at the brochure that's presumably given out during the event and you can read the curriculum for yourself. So while this gentleman was trying to impress upon me the incredible importance and value of the teaching that goes on at the event he casually mentioned that attendance isn't mandatory and that kids who don't attend receive safety instruction at school. So you mean to tell me Mr. School Board guy that you can teach the same stuff at school without plying 4 year old children with sugary fruit drinks, chocolate chip granola bars, free McDonald's soft-serve ice cream along with a pile of preschooler McDonald's branded swag?! The part that's truly mind-boggling? That this gentleman, despite having all of the above pointed out to him, and despite his very genuine and well-intentioned concern for the children, was unable or unwilling to see McDonald's involvement as problematic. He seemed to think that I've got it in for McDonald's specifically and despite a lengthy and civil discussion, I'm not sure I was able to convey to him the source of my extreme consternation. To help him, I'll spell it out here. 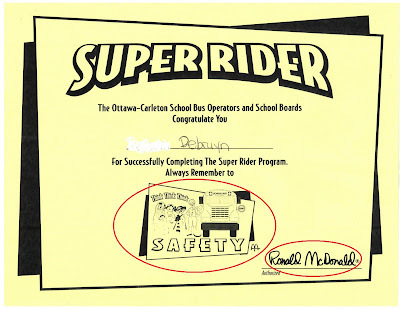 While I'm flabbergasted that the Ottawa School Board doesn't see any problem handing out sugary juice drinks, chocolate chip granola bars and soft-serve ice cream coupons to preschoolers, I'm absolutely appalled that the Ottawa School Board invites anyone, let alone McDonald's, to target innocent 4 year olds with advertising all in the name of a program that they themselves apparently recognize as being non-essential and easily taught at school.